We recognize that different customers have different needs and therefore, we offer personalized customer support. In Omega, are truly ready to go the extra mile by training drivers to meet your specialized equipment requirements, including reefer, curtain side or flatbed, and supplying Hazmat-certified drivers. Supplying efficient and economical private fleets. It’s more than simply earmarking trucks and drivers for you. If you need a business partner committed to meeting your specific needs, we have the people to serve as an extension of your company. Our dedicated services provide a true business partnership in supporting small to large fleets with a wide range of trucks and dry vans available. Choose Omega Freight Systems Inc. as your outsourced fleet. Using our services is guaranteed to eliminate the risk and liability that is inherent when operating in own assets. Omega Freight Systems Inc. offers steady capacity, predictable costs and an optimized distribution network in return. We commit to working closely with the customer in order to make sure we are fully meeting your transportation needs. Omega strives to find the most cost-effective method of shipping your freight. We are careful listeners to your needs, trying to find the most cost-effective method of shipping your freight. Our services include designing optimized transportation programs with logistics engineering support, help with carrier management and on-site management. We are also offer to develop alternative design model options in order to reduce overall shipping costs. If you need an extension to your current private fleet, we are here to help take assets off your balance sheet, leveraging our design capability to lower transportation costs. 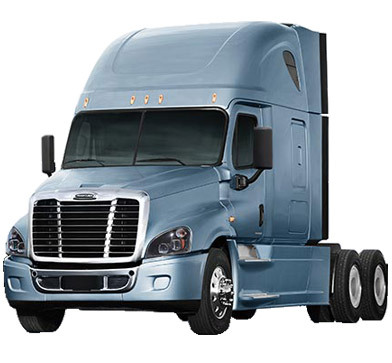 No matter how many trucks you need, or when you need them, Omega Freight Systems Inc. will provide the guarantees to meet the capacity you’re looking for. Our fleet consists of 25 trucks, with additional 25 tractors, allowing us to flex where other non-asset carriers cannot. We recognize that every shipping need is different. Our dedicated services provide custom support, such as training drivers to meet your specialized equipment requirements, including reefer, curtain side or flatbed, and supplying Hazmat-certified drivers. We can provide direct-to-store delivery capability and develop alternative design model options to reduce costs. By using our freight volume and taking advantage of backhaul lanes, we can help find revenue-sharing opportunities to improve your profitability. We invest in the latest technology to track and report your loads. We commit to frequent, transparent and open communication between shipper and the carrier and set clear expectations on the onset of the start-up program. In commitment to fully meet our clients’ need, we timely provide proof of delivery and personalized reporting on request. Omega Freight Systems Inc. has always focused on safety and the supporting technology. We are committed to being at the forefront of safety compliance. Our drivers and staff is comprehensively trained by leading experts to help ensure our drivers and staff are well prepared. Our trucks are equipped with the latest safety innovations, including up-to-date manual and auto-shift transmission technology, traction and stability control, and right-side cameras to minimize blind spots. You can trust your freight to one of the safest carriers in the business. A cause Omega Freight Systems Inc. truly cares about is ecology. We strive to minimize our impact on the environment by switching to fuel-efficient tires, custom aerodynamic tractors and trailers and the implementation of fuel conservation technology. Omega Freight Systems Inc. has developed an approach that is dependent on several key factors and produces results. Our team strives to find efficiencies within your network during the implementation – and beyond – by developing Key Performance Indicators, methods to increase utilization, eliminate assets, etc. One truck, one driver, endless solutions. Omega Freight Systems Inc. disposes with 10 carefully screened and trained drivers on our disposal. In this way, we cover all major states. All of our drivers undergo CSA 2010 and safety training, driver simulation courses and Hazmat certification. With a state-of-the-art fleet of over 100 tractors, and access to 130 dry vans 53’ trailers, there are no restrictions. The average age of our assets is less than three years, and all include new brakes for quicker stopping. We guarantee full coverage throughout the U.S., as well as international deliveries to and from Canada. Thanks to our advanced GPS tracking systems, Omega Freight Systems Inc. provides continuous easily-accessible position record and real-time visibility on exceptions in transit. We operate on the basis of paper and paperless e-logs. By utilizing agents in our Express Consolidated Program, Omega Freight Systems Inc. provides expertise in niches not traditionally served through standard fleet. These agents are exclusive to Omega Freight Systems Inc. and use our trailer pools and are carefully instructed to meet our safety standards. Committed to taking your long haul and expedited loads further, faster, safer. Our teams haul all types of freight, including retail, expedited shipments, high-value products, time-critical shipments, and Hazmat freight. Our services are available in all 48 states, with interline service to Canada. A team of drivers can cover 1,000 miles in only 22 hours which makes up less than half of the time it takes for a solo driver to cover the same distance. Our expedited services allow us to dwell from origin to destination, reducing the need to keep large quantities of on-hand stock. Our drivers are trained professionals who understand that service is our business. More than a half of our team fleet drivers have more than five years of experience, while 15% of our drivers have Hazmat endorsements. With the average age of our truck being only 5 years and our dry van trailers are averagely 3 years in age, we ensure true expedited service with minimal breakdown. Our trailer fleet is testing and fitting the latest aerodynamic devices to meet California regulatory requirements. We have a vast array of equipment, including dry vans and reefers, with unique specialized equipment capabilities, lightweight, designed to meet all of your needs. Through EDI technology and web-based booking, or just a regular phone call, we have multiple ways to assist you with your booking needs. Our customer service staff is there to meet your needs with custom-designed reports, tailored to fit any time window from hourly to year-to-date. Our communication systems cover the customer, the office and the drivers, allowing real-time route changes, should the need arise. In Omega, we strongly believe that successful company consists of satisfied employees. We are committed to providing safe working environment, through initial, ongoing and specialized safety training for our drivers. We strive to maintain high standards in employee selection and ensure future success and continued prosperity of our company, employees and customers. Omega strongly adheres to Federal, State, and Local safety, health and environmental Laws and Regulations and seeks to prevent unsafe acts through timely corrective action. Omega Freight Systems Inc. offers a wide range of services, and you can expect us to be ready to meet requirements such as sensitive shipments, providing parts for your assembly line, handling the increasing inventory levels and any kind of unexpected shipping emergency. Whatever your critical-shipment need, Omega Freight Systems Inc. can offer a solution. We specialize in same-day shipping and overnight delivery of critical freight. We are genuinely aware that with constant-changing economy, the customer requirements also change rapidly. Therefore, in Omega Freight Systems Inc. we are able to offer a solution for all of your time critical shipments. If you need to ship same day, overnight or across the country, Omega Freight Systems Inc. is the right place to turn to. We provide all the necessary equipment at the right place and right time to get your sensitive freight delivered on time. Our thoroughly trained Operational Staff is available 24/7/365 to ensure you every need is being met. Omega Freight Systems Inc. provides you with a rate quote, an opportunity to book your load or track your shipment at in moment’s notice. Omega Freight Systems Inc.'s family owned company provides the personal touch of a small company while offering the technology and innovation of a larger one. For any shipping requirement that you might have, please contact Omega Freight Systems Inc. today.